This time of year can be strange. Poised between the aftermaths of Christmas and looming New Year, it marks a nebulous passage of time that disturbs daily routines and structures, creating an environment where one loses sight of many things, including day of the week. It’s also a time when your middle-aged neighbour, having secured a week off work and sent the wife and kids packing to the in-laws, can play his old Led Zeppelin records at full volume, transporting him back to an era when he was blessed with a full head of hair and could still see his toes when standing up. It’s this sonic connection to music of your past that almost seems to have therapeutic qualities, reminding us of, for example, listening to Smashing Pumpkins’ Siamese Dreams in your bedroom and your parents worrying about what kind of unfamiliar subculture their kid may be involved with, or ditching school and going to a friend’s house to play Cypress Hill’s Temples of Boom while engaging in activities justifying your parents’ worries in the first place. In that sense, music is a great sensory connector, the melodies and sounds carrying us back to a time and place that may be gone, but certainly isn’t forgotten. Simply Red’s masterpiece album, Stars, is a record that means a great deal in Britain. Released in 1991, the album was a best seller for two years straight and remains the thirteenth highest selling record in British history. Even more than a generation after its release, many cite Stars as one of the greatest albums of all time, perhaps even the greatest album ever recorded. It’s that good. 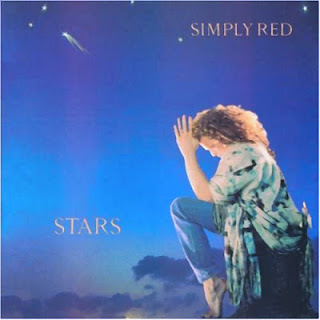 Mick Hucknall, lead singer and man behind Simply Red, took the band to new heights with Stars, creating an album of distinct personality and marvellous compositions. Produced by an American called Stewart Levine, Stars was a stellar success, a critical and commercial achievement that remains proudly British. Unlike the mixed attitudes British pop albums like Adele’s 21 or Mumford and Sons’ Babel received in the aftermath of their successes, Stars has always been reflected upon more favourably, a triumph that deserved its glory. It played well with both casual music listeners and with those that treat music like a religion. It was an album that once again showcased why Manchester, England is a powerhouse of great music artistry and continues to generate bands that create life changing songs. Whether it is the Stone Roses, Smiths, Joy Division, Happy Mondays, Dirty North, Doves, New Order, Oasis or Simply Red, Manchester is the rhythmical beating heart of British music. Stars was never quite the phenomena in America that it was in Britain, primarily because the music landscape over there during this time was populated by angry white guys with guitars and a grunge culture that didn’t want to be associated with pop harmonies or melodies instilling feelings of splendour and beauty. In Britain, Stars remains timeless. There is not one bad song on the album and some tracks are endlessly repeatable. Stars is a sonic reminder of begging your big sister to give you a ride somewhere and her insisting on playing it in the car, or a memento to how almost every place you visited at the time would use this album as its official soundtrack. It’s an album for everybody yet remains deeply personal. In short: it is simply spectacular. You're right that the album wasn't a phenomenon here. I haven't heard these tunes before, although I'm familiar with other Simply Red songs. I've been going down memory lane this holiday season listening to songs, looking through photo albums, etc., things I don't normally have time for when I'm working. but I will admit that now is a great time to listen to music, though unfortunately I'd say it's much to late for the Stars to be added to my playlist.
" It’s also a time when your middle-aged neighbour, having secured a week off work and sent the wife and kids packing to the in-laws, can play his old Led Zeppelin records at full volume, transporting him back to an era when he was blessed with a full head of hair and could still see his toes when standing up." Grooveshark would only allow me to listen to 5 of the songs, but what I heard, I loved. Again, you should probably set up some sort of affiliation with Amazon and/or iTunes, because you are sending a lot of business their way (at least for me!). I should probably (rather embarrassingly) admit that I have no intention in working out with my new Nikes - I want to wear them with dresses!